It's surprising how few people take seriously the simple act of backing up their data. The reasons for this are many. Maybe they think that their laptop will never break, that everything is in the cloud anyway, or that it's just too much hassle. But, the truth is that a worrying number of people are one hard drive failure away from losing photos, videos, documents, or other important files that can never be replaced. Then there's the rising threat of Ransomware infections, which encrypt data on a device and literally hold it to ransom until the users pays up. Even then, there's no guarantee that the criminals will return their captives safely. All of these stomach turning scenarios are avoidable though, if you take a small amount of time to back up your system on a regular basis. To help you, we've put together this comprehensive guide which shows how to quickly back up your most important files. We'll also lay out the various options for creating system backups of your whole PC or laptop, so that if the hard drive fails you can restore it back to just the way it was. There's also tips on how to backup mobile devices too, as much of the data we generate these days begins life under those brightly lit displays. What kind of backup do I need? There are a variety of backup styles on offer, so we break down the main types below. You'll definitely want to pick one, but it's wise to use multiple techniques and create multiple backups. This is to prevent a double disaster, by finding that the sole backup you've created is corrupted or didn't cover what you thought it did. This is the simplest way to back up files from your PC. Just plug in a USB hard drive or flash drive and use Windows Explorer (File Explorer in Windows 8.1 and 10) to copy files from your computer to the removable drive. It's completely manual, but if you set a reminder to do it once per month and leave it copying while you're off doing other things, it really doesn't take much effort. Plus, once the backup is done and the drive is disconnected, it's offline and safe from ransomware attacks. Try using the built-in File History feature in Windows 10, or Windows Backup & Restore in Windows 7. 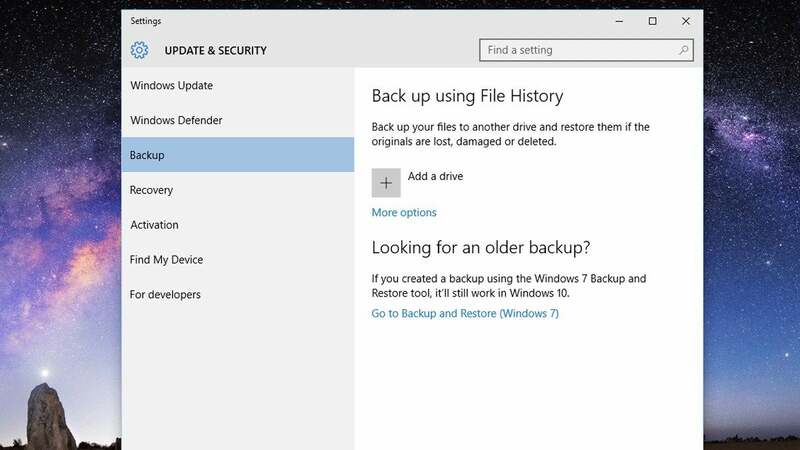 You can see how to use the former in our How to backup Windows 10 feature. Dropbox, OneDrive, Google Drive, pCloud and many other cloud storage services make it supremely easy to make backups of your files, and the free storage on offer when you sign up may just be enough. If it isn't, you can pay a reasonable monthly or yearly fee to get a lot more storage. Just bear in mind that most cloud storage services sync files in a certain folder on your computer. This means if you delete a file in that folder, it will disappear from your online storage as well. Many services have an undelete feature (like a Recycle bin) so you can undo your mistake, but this might be limited to 30 days, so check! A real benefit of cloud storage is that it creates a copy of your files in a physically separate location. They're safe from flood, fire and theft. Cloud storage has lots of other advantages too: you can access the files from practically any computer with an internet connection and you can keep files in sync across multiple devices. The first two methods back up certain files, but they're not sufficient to get your PC or laptop up and running after a hard drive (or SSD) fails, or if your computer is stolen. Making a backup of all the files on your hard drive is also known as a 'disk image' or 'ghost image', and you'll need specialist software to do this. This needn't be expensive though, as there are free and paid versions available. Acronis True Image is one popular paid-for package, costing £45.99 per year to cover three PCs. Free options include Macrium Reflect and EasUS Disk Copy (free for hard drives up to 1TB). The best way to automatically back up your phone (or tablet's) photos and videos is by using Google Photos. If you choose the 'High quality' option rather than 'Original quality' you get free, unlimited storage. That's pretty much impossible to beat, and you can get the Google Photos app for a wide variety of devices. Here's our step-by-step guide to using Google Photos to back up your photos and videos. For the other stuff stored on your mobile, such as contacts, notes and more, use the options available on the device. For iPhones, iCloud is perfectly good, and 5GB should be enough free space, while on Android, your stuff is automatically backed up to Google (assuming you opt in). Read our How to backup Android and How to backup an iPhone guides for more details. We'll admit there's no one-button solution for backing up all your devices at once, and that no form of backup is guaranteed for life. Let's say you backup all your photos to writable DVDs (not really necessary these days, but something you might have done in the past). It's not going to be long before all the DVD drives are gone (few laptops have them any more), and there's no way to get the photos off those discs. The point is: it's crucial to keep up with the times and make sure your files are moved off any device or platform that may not be accessible for much longer. Another important point to consider is file versions. If you're modifying a file because you're working on it and developing it, it's useful to be able to return to previous versions. Some backup software supports versioning, as do some online backup and cloud storage services, including Dropbox. If you're using software to backup your entire PC, be aware of the difference between incremental and full backups. Because only a subset of files changes between backups, there's no need to regularly backup all 500GB, say. Only new files and those which have been modified need to be backed up - this is called incremental backup. Yet another thing to watch out for is the ease of restoring backed up files. Some software and services allow you to get inside a backup and retrieve specific files, while others force you to restore the entire backup. This is why it's important to read reviews of backup software. What should I use to backup my Windows PC? Traditionally, backups have been carried out locally to external hard drives, but you can also use optical discs such as DVD or Blu-ray, or a USB flash drive if you don't have many large files. Ideally you should do this as well as using an online service. Optical discs are cheap but hardly convenient. You can't schedule a backup at night, for example, because you'll have to be present to swap discs. And you can't easily back up files from a phone or tablet to DVD or Blu-ray. For archiving - storing data long term - you'll also have to give consideration to data longevity because this varies from one type of media to another. A hard disk will probably be reliable for five years although the risk of accidental damage is greater, and for flash drives 10 years has been suggested, but reports vary. Exactly how long data lasts on optical media depends on a number of factors such as whether the disk is writable or re-writable, the manufacturer, and the environment in which it's stored. Under optimum conditions data should be readable for a century but there have been reports of discs being unreadable after just two years. We somehow doubt that DVD and Blu-ray drives will be around to read such disks in 100 years, so it's important to periodically write your archives to the latest media to ensure the files can be accessed by current hardware. You should also give some thought to storage of your backup or archive media so that it isn't lost in the event of a fire, flood or theft. Consider using a fireproof safe or, better still, storing it well away from your PC, perhaps in a friend's house locally. You can create local backups or archives with no special software at all, simply using Windows Explorer to copy files and folders to your backup media. However, dedicated backup software makes the job a lot easier and provides additional features too. Which backup software is best for me? First things first, Windows 10 has it's own built-in backup feature. It's called File History, and you can find it in Settings>Update & Security>Backup. This allows you to make regular, scheduled backups of your data onto an external drive. The feature has a default setting of backing up any changes to your files once every hour, but this can be changed to other intervals if you prefer. 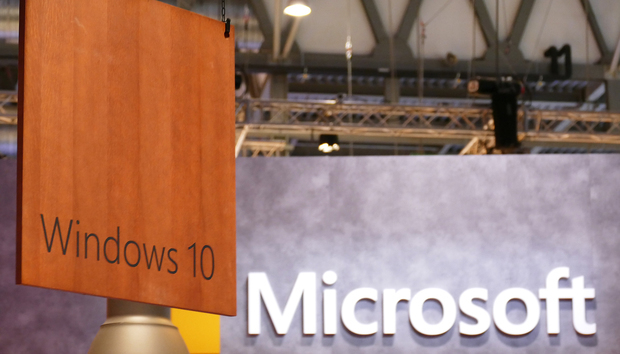 For a full breakdown of how to use File History take a look at our How to backup Windows 10 guide. Windows 7 also has a built-in backup utility: Windows Backup and Restore. Which you'll find if you type 'backup' into the Start menu search box. Good backup software should be able to schedule backups so that they take place automatically at regular intervals. This is useful if you use an external drive which you leave connected to your computer. Just remember that if the disk isn't attached to your PC then the backup will fail. Similarly, scheduled backups aren't helpful if you're using optical disks as you'll have to insert them manually. On the subject of multiple discs, backup software will automatically split the files and folders so each disc's full capacity is used. Depending on the software, it may produce a single file which can only be read by the program itself, or it may be readable by Windows natively. Another common feature is support for incremental backups which we mentioned earlier. This way, only files that have changed since the last backup are copied to the media to reduce the time taken to copy data. Compression can also reduce the time taken as less data has to be written. Some applications are able to back up 'locked' files, which are those that you're working on during the backup process. Yet another thing to look out for is the ability to back up files and settings outside of your Documents, Photos, Music and Video folders, such as contacts, email, web browser bookmarks and even saved game files. It's crucial to ensure you're backing up everything you need to return you to where you were in the event of a disk failure. In fact, some backup software offers the ability to backup your entire hard disk (this is known as disk imaging). The advantage of this approach is that in the event of a disk crash, recovery won't involve re-installing all your software and setting up all the Windows options and preferences. Creating a disk image is great if you need to recover from a major incident such as complete hard disk failure. However, the convenience comes at a cost, namely that backing up will be more time consuming and you'll need to use much higher capacity media - usually another hard disk of the same size. Our recommendation - and you may disagree - is not to bother with disk imaging. After all, disk crashes are relatively rare occurrences and if the worst does happen, having to start again from a blank hard disk will give you the opportunity to install Windows afresh and leave behind the flotsam and jetsam that slows Windows down after a while. What's important is that you have all your files and settings backed up plus your application CDs and DVDs (and serial numbers) to hand. Should I use a Cloud backup service? The alternative to local backup is to back up online and - as with everything - there are pros and cons to this approach. The major benefit is that it's easy. You don't have to make any decisions about what type of media to use and you don't have worry about media becoming obsolete. You can also rest assured that your data is safe from fire and flood thanks to multiple redundancies where your data is stored in multiple places. On the reverse side of the coin, there's the risk that your backup service provider might go bust. There are no guarantees that even the largest companies will stay in business. Plus, there's also the issue about the security of your data as it's sent over the internet and stored on someone else's servers. It pays to choose a company with a good track record to look out for companies with ISO 27001 accreditation: the international standard for data security. This not only covers the potential loss of data, but also applies to unauthorised access. Take a look at our Best Cloud Storage services 2017 guide to keep up to date with all of the top providers available at the moment. The good news is that most reputable companies employ encryption so prying eyes can't see the contents of your files when they leave your PC. This way there's no risk to your data as it flows across the internet and even staff at the backup company will be unable to read your files because they are totally impregnable without a secret key which is known only to you. Of course, the other drawback of the cloud is that making backups can take a long time. Speed is limited by your broadband connection. Don't forget your quoted broadband speed is the download speed; the upload speed is typically much, much slower to the extent that backing up gigabytes and gigabytes of data becomes totally impractical and may even exceed your allowances for the month if you have a data cap. You'll have to work out whether the volume of files you want to backup is feasible on your particular broadband connection. It's worth checking the small print scheduling backups so they run overnight. Unless you live in a remote area of the UK, it's certainly a good idea to incorporate online services as part of an overall backup strategy. Many of the main options offer free storage, albeit in limited quantities, but these can be increased through subscriptions, which start from around £5 per month. If you've been reluctant to give backup the attention it deserves, we hope we've demonstrated that it needn't be as time-consuming and expensive as you might have feared. And remember, that effort will be well worth it the moment that your hard disk fails, you suffer a virus attack, lose your laptop, or someone steals your pride and joy.